Microsoft Dynamics 365 for Sales reporting can become faster and simpler with a reporting solution based on the ELT Data Warehouse automation software, ZAP Data Hub. Optimized for Dynamics 365, it replaces inefficient manual processes and the strain on IT. To quote Microsoft themselves, D365 Sales allows you to “go beyond sales force automation (SFA).” But the software can present time-consuming challenges when it comes to reporting. Our reporting solution uses ZAP Data Hub’s smart data connectors and pre-built D365 data models to overcome this challenge. ZAP Data Hub – our ELT and data warehouse automation software – is optimized for both the Professional and Enterprise editions of Microsoft Dynamics 365 for Sales. It will automate the access, integration and preparation of your D365 Sales data for reporting, and help when upgrades are required, too. Dynamics 365 for Sales SFA processes can drive the success of a business. Using ZAP Data Hub to automate the access, integration and preparation of the SFA data within it will not only increase ROI on the software but also remove the need for coding, scripting or consultancy when reports are required. Manual data processing brings a significant risk of human error. It can also be slow and ungoverned. Human error might come from copy-and-paste mistakes or misinterpretations of workflow process. To say nothing of key-person dependencies. ZAP Data Hub’s D365 reporting solution removes these risks. If your business is running has more than one instance Microsoft Dynamics 365 for Sales – perhaps across multiple offices or sister companies –ZAP Data Hub will automatically integrate and unify each instance to provide cross-functional reporting. As well as Dynamics 365 for Sales, ZAP Data Hub is optimized for all other Dynamics solutions, as well as Sage, Salesforce, SAP Business One and SYSPRO, with pre- built connectors for over 100 other financial systems and databases, too. ZAP Data Hub D365 Sales reporting solution can connect to Cloud, Cloud + Edge and Local Business Data installations. Additional data sources – either cloud or on-premises – can also integrated for enhanced, consolidated reporting. 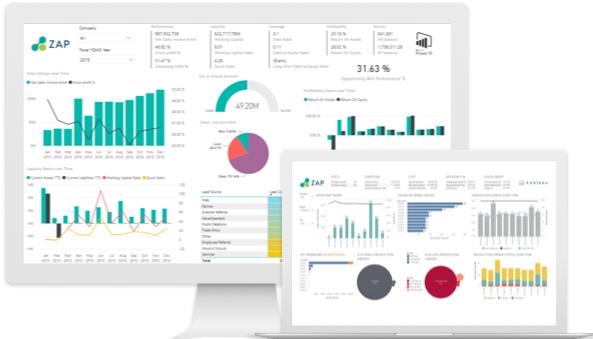 Financial and operational reporting can be automated from Dynamics 365 for Sales in Microsoft Power BI by using ZAP Data Hub to automatically access and structure your data – from 365 and all sources – in a pre-built data warehouse. ZAP’s smart data connectors and pre-built data model for Dynamics 365 will automate data preparation for Tableau. ZAP is a Tableau Technology partner, too, our mission being to make business reporting in Tableau as easy as possible. ZAP Data Hub should be considered if you use Qlik – Qlik View or Qlik Sense — for Business Intelligence and/or reporting, or if it one of a set of tools in use. Or, equally, if your business is migrating from one BI system to another.